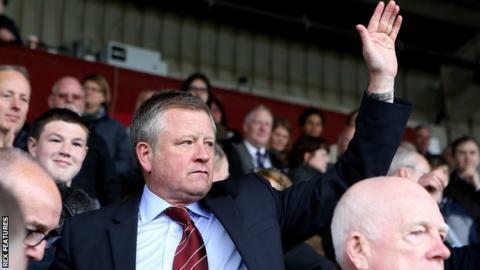 Northampton Town manager Chris Wilder has been unable to reach an agreement with Charlton Athletic following talks with the relegated Championship club. Charlton were given permission to speak to Wilder and assistant Alan Knill, after the pair led the Cobblers to the League Two title this season. Following a meeting, Charlton say the club "will now continue its search for a candidate to take the club forward". Jose Riga resigned as Addicks boss after their relegation to League One. Northampton Town chairman Kelvin Thomas said: "We understand there is further interest in Chris and Alan however we have had no official approach at this point." Charlton triggered a clause in the contracts of Wilder, 48, and Knill, 51, in order to speak to the pair, who guided Northampton to a runaway success this season after a 24-game unbeaten run. Their promotion was achieved despite financial uncertainty earlier in the campaign because of outstanding loan repayments of £10.25m to the local council and a winding-up petition from HM Revenue & Customs. Next season the Cobblers will face a Charlton side who have had four managers, including Riga twice, and one interim boss since Roland Duchatelet bought the club in January 2014. The breakdown in talks with Wilder and Knill follows unrest at The Valley, with supporters staging a sit-down protest outside the ground before last Saturday's game, the latest in a string of demonstrations against Duchatelet.